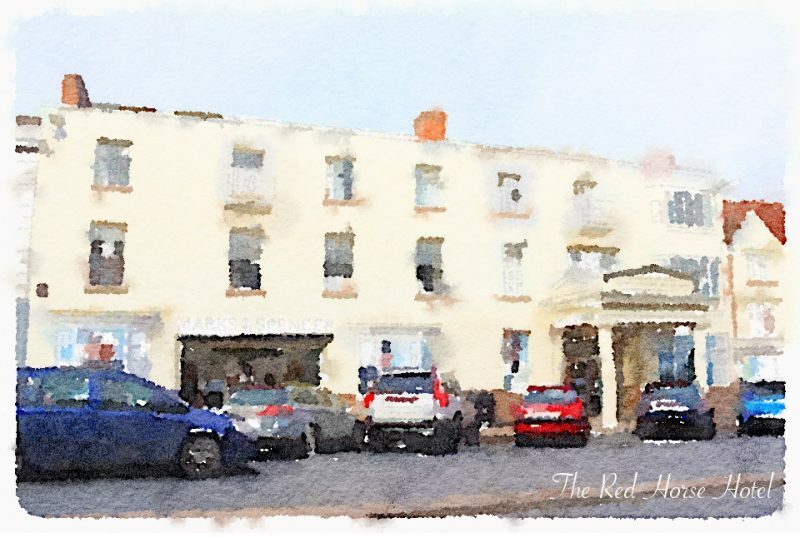 Upon exiting the Railway Station make your way onto Alcester Road, then straight across to the end of Greenhill Street, and turn left onto Windsor Street. Follow the Street until you reach the statue of the jester (on your right) at the top of Henley Street. 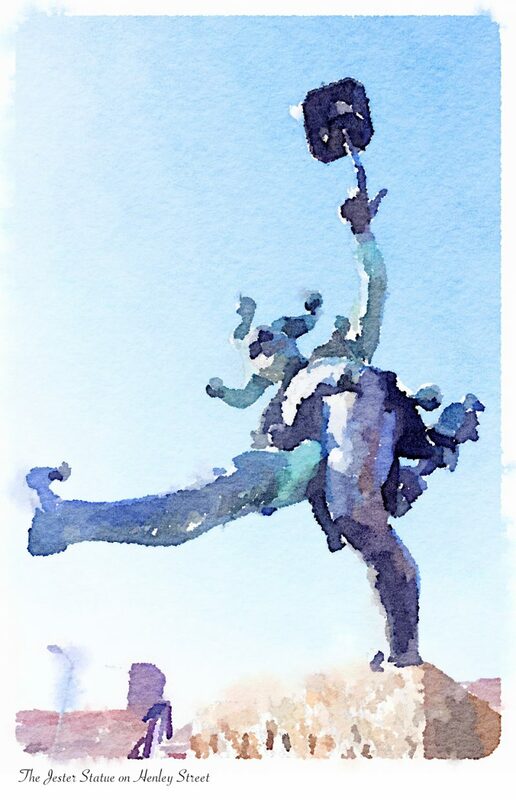 When I visited, one (nimble) fool had put a traffic cone on the end of the jester’s marotte. Walk down Henley Street until you reach the Shakespeare Centre. 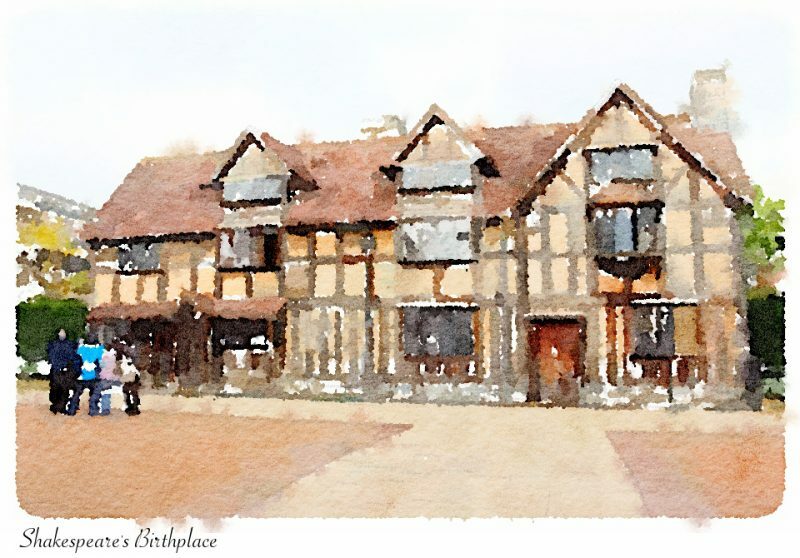 This is where you can buy tickets for the properties owned by the Shakespeare Birthplace Trust. It’s also the way in to see the house in which Shakespeare was born. Continue down Henley Street, and when you reach the roundabout, cross over to Bridge Street. As you walk towards the River, you’ll see Marks and Spencer’s on your left. This building used to be the Red Horse Hotel. Washington Irving stayed here around 1818 and wrote about Stratford in The Sketchbook of Geoffrey Crayon. For many years afterwards, it was possible to stay in the “Washington Irving Room”. At the end of Bridge Street, turn right and follow the road past the Royal Shakespeare Company building. If you’re hungry and the weather’s nice, you might like to find a seat in the RSC cafe that overlooks the River. Then turn right into Chapel Lane and follow it all the way down to Chapel Street. On your left, at the corner of the two roads, is the Guild Chapel. You can go inside and take a look at some beautiful 16th century wall paintings that Shakespeare’s father, as chamberlain, was ordered to have limewashed. On the other corner of Chapel Lane and Church Street is Shakespeare’s New Place. This is the house that Shakespeare bought on his return to Stratford from London, and that he intended to be the family home. Sadly, the house is no longer there, but the gardens are very beautiful, and there are some very knowledgeable guides who can tell you all about the history of the place. My dear Keats, I shall go mad! In a field at Stratford-Upon-Avon, that belonged to Shakespeare, they have found a gold ring and seal, with the initials ‘W. S.’ and a true lover’s knot between. If this is not Shakespeare, who is it? A true lover’s knot! I saw an impression today, and am to have one as soon as possible. As sure as that you breathe and that he was the first of beings, the seal belonged to him. My dear Haydon — In sooth, I hope you are not too sanguine about that seal — in sooth I hope it is not Brumidgeum — in double sooth I hope it is his — and in triple sooth I hope I shall have an impression. If you are after an impression of (what is possibly) William Shakespeare’s seal, you can purchase replicas from the Birthplace shop, or even a moderately overpriced stationery set with a seal coin and wax. Exiting New Place, turn left down Church Street and cross Chapel Lane. 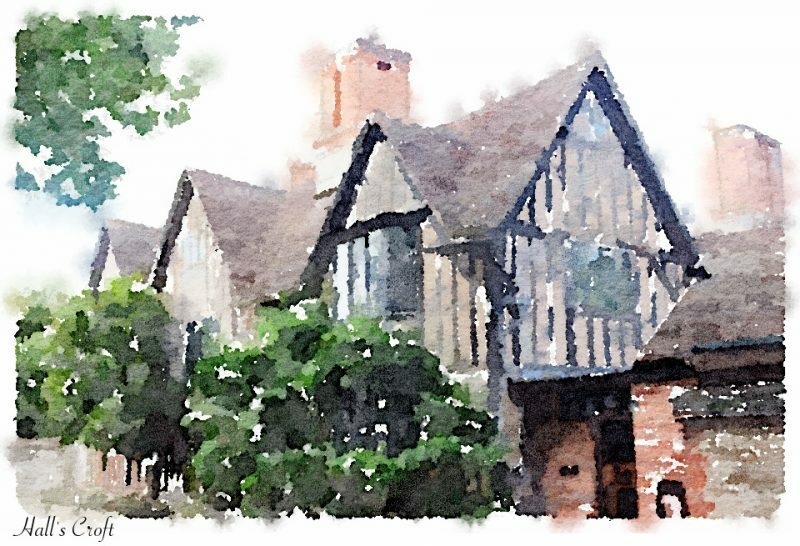 Past the Guild Chapel, you’ll see Shakespeare’s schoolroom, and the almshouses. This is thought to have been where little Will would have learnt his little Latin, which may have been the inspiration for the schoolboy scenes in The Merry Wives of Windsor. Continuing down Church Street, you’ll see Mason Croft on the right-hand side. A blue plaque commemorates Marie Corelli, who lived here from 1901 until her death in 1924. Mark Twain visited Corelli here in 1905, but despite her best efforts he described the visit as “the most hateful day my seventy-two years have ever known”. They can have had little in common, for in contrast to Irving, Twain was sceptical of Shakespeare’s existence and later published his doubts in a book titled, Is Shakespeare Dead? Nevertheless, Corelli was the most popular writer of her day. She was quite an eccentric, and kept a gondola and gondolier who ferried her up and down the Avon. Corelli also campaigned tirelessly to save historic buildings around Stratford, particularly those connected with Shakespeare. Her efforts – which seem natural and commendable to us today – gained her many enemies and led to some very personal attacks being published against her. If you’re a fan, you’ll want to take a detour to visit her grave with its newly-restored monument. Turn right onto Chestnut Walk, and continue until you reach Rother Street. Turn left and cross the street at the traffic lights. Walk down the street until you reach the roundabout. Cross Shottery Road then turn right into Evesham Road. Walk along Evesham Road until you reach the traffic lights on the pedestrian crossing, then cross the street. After a few more minutes walking, you’ll see the cemetery on your left. 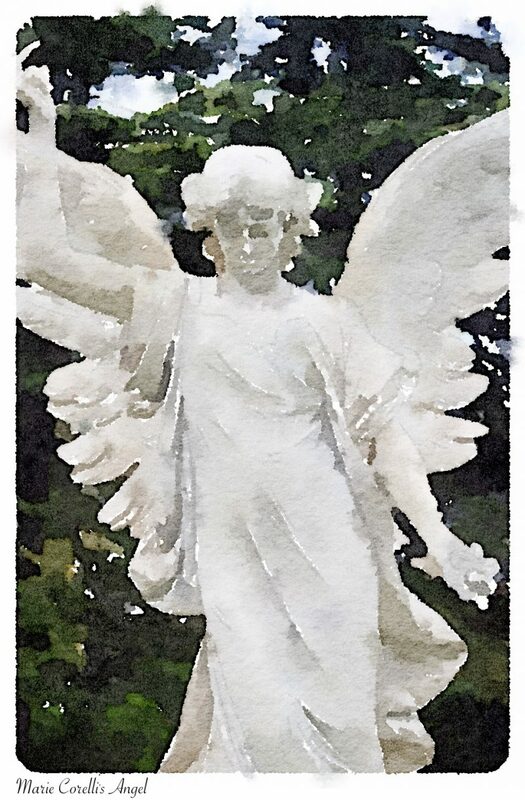 The angel on Corelli’s grave is visible from the road, and as soon as you enter through the gates. Corelli’s companion, Bertha Vyver, is buried next to her. The graveyard is a beautiful place to have a quiet rest, away from the tourists. When you’re ready, retrace your steps back to Chestnut Walk and the junction with Church Street. Turn left from Church Street (or continue straight if you’ve come down Chestnut Walk). A minute’s walk will bring you to Hall’s Croft on the left-hand side. This was the house of Dr. Hall, who married Shakespeare’s daughter, Susanna. Continue along Old Town Road, and you’ll find yourself in front of the gates of Holy Trinity Church. Shakespeare was not only buried, but also baptised here. Anne Hathaway and their daughter Susanna are buried beside Shakespeare. Just over the grave, in a niche of the wall, is a bust of Shakespeare, put up shortly after his death and considered as a resemblance. The aspect is pleasant and serene, with a finely-arched forehead; and I thought I could read in it clear indications of that cheerful, social disposition by which he was as much characterized among his contemporaries as by the vastness of his genius. The inscription mentions his age at the time of his decease, fifty-three years—an untimely death for the world, for what fruit might not have been expected from the golden autumn of such a mind, sheltered as it was from the stormy vicissitudes of life, and flourishing in the sunshine of popular and royal favor? The feelings, no longer checked and thwarted by doubt, here indulge in perfect confidence: other traces of him may be false or dubious, but here is palpable evidence and absolute certainty. As I trod the sounding pavement there was something intense and thrilling in the idea that in very truth the remains of Shakespeare were mouldering beneath my feet. 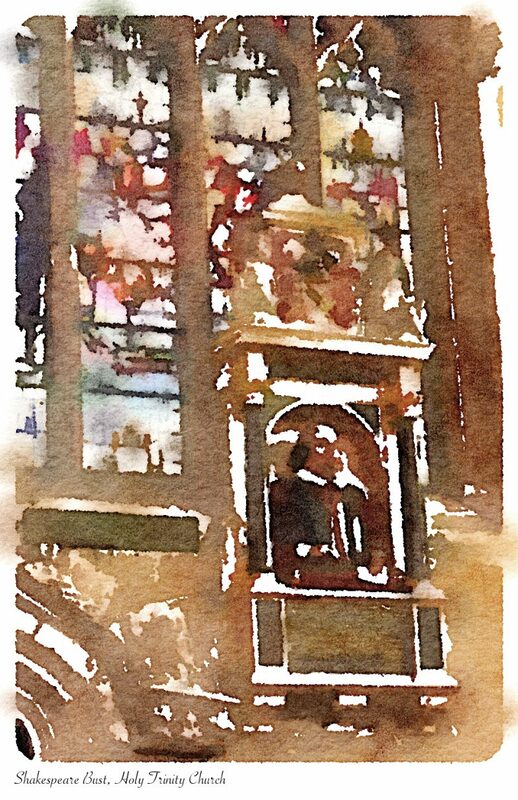 It was a long time before I could prevail upon myself to leave the place; and as I passed through the churchyard I plucked a branch from one of the yew trees, the only relic that I have brought from Stratford. Exiting the Church, walk back down the avenue to the gate, and retrace your steps until you reach the entrance to the RSC Gardens. If you take the path along the river you’ll come upon a strange structure that is currently disused. 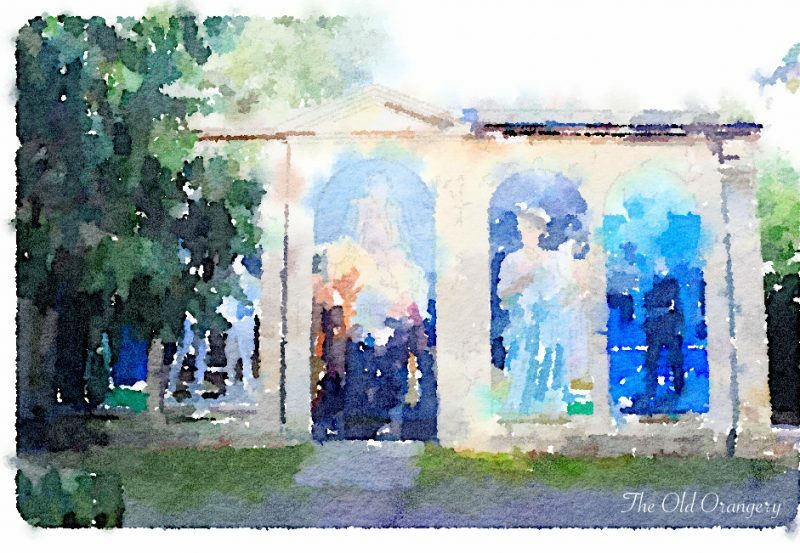 The south side is a portico that is closed off with giant photographs of stage actors, and the north is a rotunda. This is all that remains of the house that was once Avonbank School. Both Elizabeth Stevenson (later Elizabeth Gaskell) and Euphemia Gray (later Effie Ruskin and then Effie Millais) attended this school, the former in the 1820s, and the latter in the 1840s [source]. In one of the bed-rooms (said to be haunted), and which, with its close pent-up atmosphere and the long shadows of evening creeping on, gave me an ‘eirie’ feeling, hung a portrait so singularly beautiful! a sweet-looking girl with paly gold hair combed back from her forehead, and falling in wavy ringlets on her neck, and with eyes that looked like violets filled with dew for there was the glittering of unshed tears before their deep dark blue — and that was the likeness of Charlotte Clopton, about whom there was so fearful a legend told at Stratford church. In the time of some epidemic, the sweating-sickness, or the plague, this young girl had sickened, and to all appearance died. She was buried with fearful haste in the vaults of Clopton chapel, attached to Stratford church, but the sickness was not stayed. In a few days another of the Cloptons died, and him they bore to the ancestral vault; but as they descended the gloomy stairs, they saw by the torch-light, Charlotte Clopton in her grave-clothes leaning against the wall ; and when they looked nearer, she was indeed dead, but not before, in the agonies of despair and hunger, she had bitten a piece from her white round shoulder! Of course, she had walked ever since. Many people are familiar with Shakespeare’s town, Stratford-on-Avon, quaint and peaceful and beautiful in itself, and in all its surroundings. Outside it, many roads lead to many lovely glimpses of landscape; but there is one road in particular which winds uphill, and from which, at certain times, the town itself is lost sight of, and only the tapering spire of Holy Trinity Church — Shakespeare’s Church— can be seen. 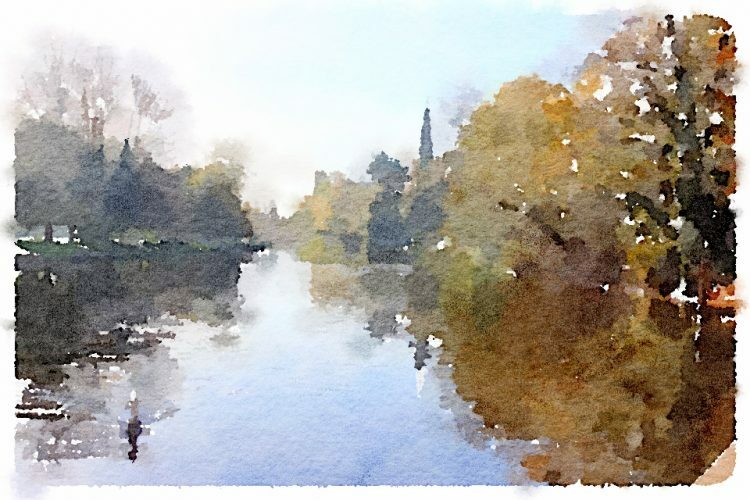 Frequently at sunset, when the rosy hue of the low clouds mingles with the silvery mist of the river Avon, all the houses, bridges and streets are veiled In an opaque glow of colour— and look like “mirage,” or a picture in a dream. And then, the spire of Shakespeare’s Church, seen by Itself, rising clear up from the surrounding haze, puts on the distinct appearance of a Pen, — pointing upwards as though prepared to write upon the sky. Often and often have I seen it so, and others have seen it with me, glittering against clouds, or lit up by a flashing sunbeam. I have always thought it a true symbol of what the Power of the Pen should be — to point upwards. To point to the highest aims of life, the best, the greatest things; to rise clear out of the darkness and point straight to the sunshine! For, if so uplifted, the Power of the Pen becomes truly Invincible. If you have a little extra time, you might like to cross the river and visit the Stratford Butterfly Farm. If you would like some refreshment, I can recommend the Fourteas Tearoom on Sheep Street. 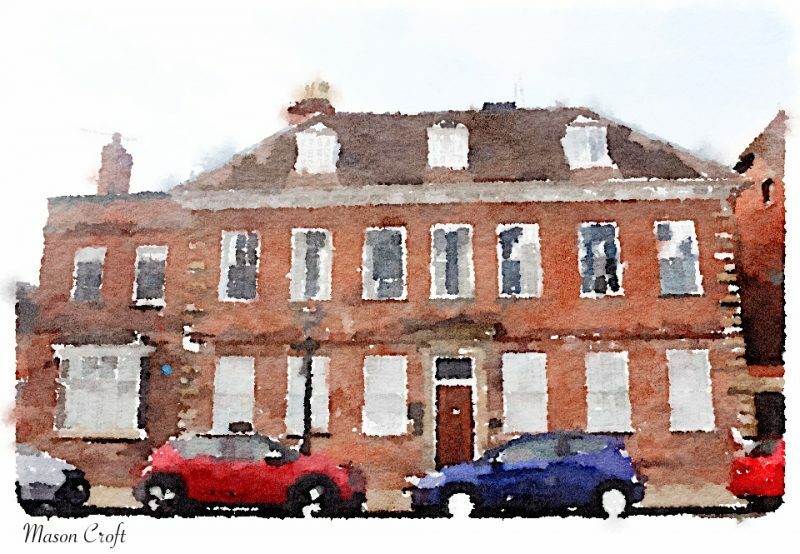 Afterwards, follow Waterside to Bridge Street and retrace your steps to the Railway Station (along Bridge Street, Wood Street, Greenhill Street and back to Alcester Road).